In Tamil Nadu, there exists a mutually beneficial relationship between the reel and the real, as evident in politics (for nearly 50 years, Tamil Nadu has been ruled by people associated with the film industry), businesses (the ads and campaigns), media (the spike in TRP ratings of programs that involve stars), sports (brand ambassadors for league teams), and even philanthropy (the various funding organizations owned by stars). Hence, it cannot be surprising that our stars command extreme affection from people, or else such influence in diverse fields would not be possible. According to statistics, Superstar Rajinikanth has about 35000 fan clubs in Tamil Nadu alone, while Amitabh Bachchan, who has a pan-India appeal, has around 20 fan clubs in India. Such is the appeal of Cinema to Tamilians. These days, it is Ilayathalapathy Vijay and Thala Ajith who command this sort of regard from Tamil audience. They get the best opening weekend collections, among their contemporaries. They have massive number of fans – a newsbyte, a snap from their movie or a clip is received with thunderous Retweets and Likes. However, it is this extreme affection that makes fans cross the line to become fanatics. Once the line is crossed, things get murky and uglier. This, precisely, was one of the reasons why Ajith disbanded his fan clubs. On the eve of his 40th birthday, Thala Ajith announced the decision to disband all fan clubs, stating that while he appreciated his fans' work and dedication, it would be better for them to not use clubs to further the needs of parties and individuals. And, Ilayathalapathy Vijay, who at present follows Superstar Rajinikanth in the number of fan clubs functioning with his name, uses fan clubs mainly for altruistic activities. The two Superstars – Ajith and Vijay – take great care to keep their fans in check. 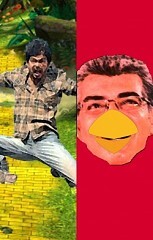 During Mankatha shoot, Ajith had invited Vijay for a Biriyani feast. During Jilla success meet, Vijay congratulated Ajith’s Veeram team for their success as well. Despite their best efforts, their supporters engage in verbal battles. Now the fanatics have stooped to an all time low – they have released games that offend the respective star. While, ‘Aj**ry Birds’ and ‘Fa**y Ajith’ target Thala Ajith, ‘Fl**py Vijay' and ‘Villupuram Run’ target Ilayathalapathy Vijay. ‘Which group started this?’ – We will never know. The painstaking effort to create a game to support their idols may merit admiration, but the condemnable idea makes it undeserving. When games such as ‘Kochadaiiyaan: Kingdom Run’ and ‘Kochadaiiyaan: Reign of Arrows’ are attempts that take Tamil Cinema forward, these mindless games only put down the genuine efforts of others. The relation among the people in the industry has always been cordial. Fans, let’s too stay so.